We are having a record heatwave in Denver. On Saturday it was officially 104 degrees (although my car said 109 and it felt like 115). It's optimal weather to: go to the movies, go to work (if it's indoors), read The Hunger Games (finally - I'd been on hold at the library forever) and go for sunset bike rides. Why a sunset ride? The Bike MS is next weekend and if I don't ride in preparation, I'm going to be sorry. I may still be sorry, since my training hasn't been as good as years past. And at sunset the sun isn't baking you, even if it is still in the mid 90s. In the coolness of the AC I was prowling in the pantry and saw a box of cake mix. What can I make to take to Jazz in the (really hot) Park? I can't just bring sangria, can I? 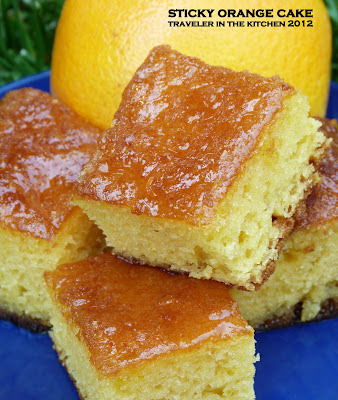 Using the nifty ingredient search feature on All Recipes, I found a recipe for Orange Cake. Citrus is nice and summery, and I was ok to turn on the oven for 35 minutes. After reading the original recipe and some of the reader reviews and modifications, this was my creation. Line a 13x9 pan with foil and spray with cooking spray. Preheat oven to 375 (for high altitude - probably 350 everywhere else). Mix cake mix, vanilla pudding mix and orange zest in a large mixing bowl. Form a well in the middle. Add remaining ingredients and mix on medium for 2-3 minutes. Pour into pan. Bake 35 minutes or until toothpick comes out clean. While the cake is in the last 10 minutes of baking, it's time for the sticky sweet delicious drizzle. Combine the juice, sugar and butter (and a little extra orange zest if you have it) into a small sauce pan. Bring to a boil for 1-2 minutes then remove from heat. Once the cake is out of the oven, let it rest a minute or two, then poke holes all over the top of it with a toothpick. Slowly spoon the drizzle (similar to what you do with rum cake) over the cake and give it a little time to sink in. Pause. Repeat until the drizzle is gone. Allow cake to cool. I cut mine into about 40 small square pieces. Perfect for sharing. Perfect for summer. Perfect for sangria.